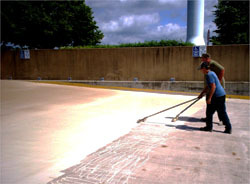 FoamCoat had completed the top deck for the VA fourteen years earlier. While it had held up extremely well, construction to the deck led to extensive damage to the surface and to new concrete that was not protected. The VA took the opportunity to update the entire top deck. 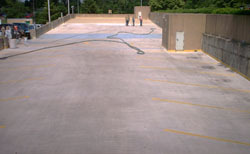 FoamCoat prepped the deck and damaged areas and applied Neogard’s Autogard to the deck. Overall, it was a pretty straight-forward project. There were some scheduling issues as the deck receives heavy usage. 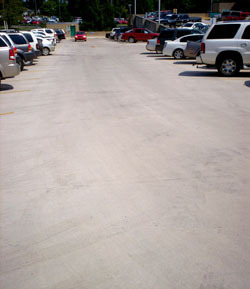 After the repair work was completed, it was simply a matter of putting down the new surface in the shortest time possible, minimizing disruption of the parking deck’s use. Neogard’s Autogard was used to cover the deck. 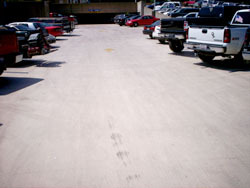 Sand was seeded into the top coat to improve traction and durability of the deck. The deck was done in halves to facilitate its availability and minimize disruption. 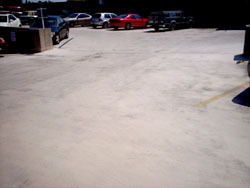 The customer was pleased with FoamCoat’s willingness to work with them to create as little disturbance as possible for their parking needs. The work was completed in just a few days and the deck was returned to a very attractive and serviceable state. It has continued to wear well since it was applied and the customer anticipates that it will provide them many years of good service, just as they had experienced with the initial FoamCoat application.